Did you know that in 2006, over 25 million people worldwide were diagnosed with Alzheimer’s Disease while one in 20 people over the age of 65 are affected by dementia… increasing to 20% of everyone aged 80 and above? In fact, every 67 seconds – someone in the U.S. develops age-related memory decline. Will that be your future? Research has shown that many brain and nervous disorders are associated with long-term nutrient deficiencies. You may not be able to look into the future and see how you’ll be in the next 10, 20 or even 30 years…but, you can nourish your body and brain with the right nutrients in the form of brain and memory supplements to support healthy neurological function for the decades to come. Getting the right nutrients in a convenient product such as Neuro-Natural General is a good place to start. Neuro-Natural General is a specially formulated brain support supplement for men and women – who want to maintain a healthy functioning brain and nervous system as they get older. This powerful formula contains a comprehensive range of neuro-specific nutrients such as L-Carnosine, Huperzine A, Vinpocetine, SAMe, Phosphatidyl L-Serine and Resveratrol…all working synergistically to support brain health, memory recall and fuel your brain and nervous system. What makes Neuro-Natural General so effective? Well, for starters, it helps support your brain’s ability to manage healthy neuroplasticity. Neuroplasticity is your brain’s ability to keep its cells flexible and able to arrange old connections while laying down new ones. With these” bendable” neurons – you can master new skills faster, improve your memory recall – and stay mentally YOUNG! But to experience optimum neuroplasticity – you’ve got to feed your brain healthy nutrients on a regular basis. A balanced diet is a good start – and Neuro-Natural General can deliver the additional brain supplementation you need to stay sharp as a tack well into your senior years! Our special enteric-coating technology ensures the beneficial nutrients (such as SAMe) which are found in Neuro-Natural General are not destroyed by stomach acid before reaching the upper intestine for optimal efficacy. That means you can be confident you’ll get those essential nutrients to your brain – and your entire body! Neuro-Natural General is a specially formulated brain, memory and nervous system supplement that works to support natural brain health and function. This formula may be taken independently. However, for the best possible results, combine Neuro-Natural General with the Core Wellness Activators! To learn more about Core Wellness Activators – click here. Other Ingredients: Microcrystalline Cellulose, Enteric Coating (Purified Water, Ethylcellulose, Ammonium Hydroxide, Medium Chain Triglycerides, Oleic Acid, Sodium Carboxymethyl Cellulose, Talc, Polydextrose), Dextrose, Silicon Dioxide, Sodium Carboxymethyl Cellulose, Magnesium Stearate, Maltodextrin, Dicalcium Phosphate. 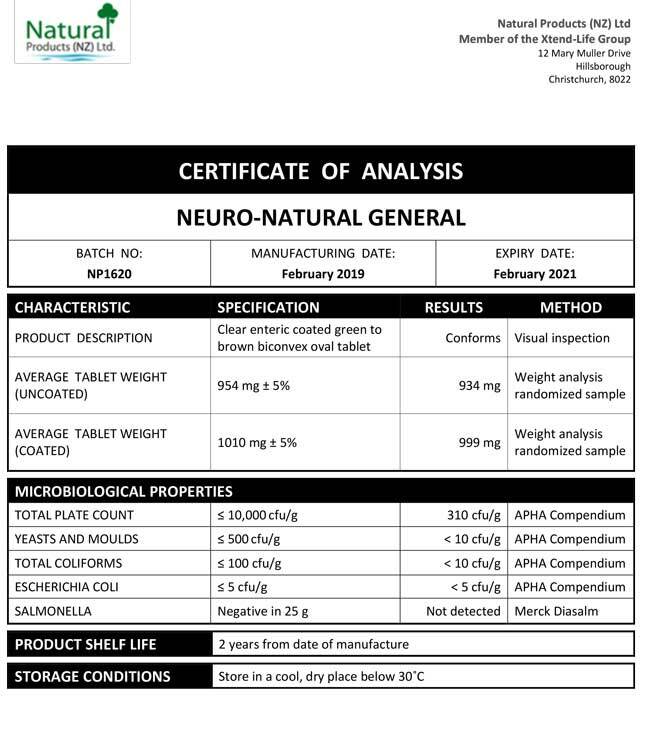 We have included below a copy of a typical Certificate of Analysis (CoA) for our Neuro-Natural General product. All of the Xtend-Life Neuro-Natural General products have the same formulation and standards. What benefits could I notice from using Neuro-Natural General? Neuro-Natural General has been designed for brain support and healthy cognitive function. Improvements may well be noticeable in terms of quicker thinking and reduced absentmindedness, plus an improved overall sense of well-being and nervous system function. What is the recommended dosage for Xtend-Life Neuro-Natural General? Daily Serving: Adults - 6 tablets. Age 12 to 18 years - 3 tablets For optimal results split into 2 doses per day; first thing in the morning, and later in the day. Take with or without food. Neuro-Natural General aims to supply various nutrients known to be valuable for brain health in order to help protect cognitive processes and overall nervous system function. It may be used in a preventative manner to help limit the likelihood of developing conditions that are all too common in today's society. In recent decades the statistics for the occurrence of and mortality rate from conditions such as Alzheimer's, Parkinson's, Huntingdon's, Epilepsy, Dementia and various conditions of the autonomic, central, and cranial nerves have continued to increase. Supporting the brain and nervous system with the bioavailable nutrients found in Neuro-Natural General may well be a wise insurance policy for the future. Can I use Neuro-Natural General as a preventative measure if I have a family history of nervous system disorders? Neuro-Natural General may be a beneficial product for use as a preventative measure if you have a family history of nervous system disorders. As with any nutritional supplement or pharmaceutical medicine, there is no guarantee of prevention against degenerative, hereditary conditions. However, by helping to protect your body's vital functions, especially in areas of known genetic weakness or susceptibility, you are giving yourself a much better chance of avoiding similar degenerative conditions. Neuro-Natural General may help, alone or along with Total Balance, Omega 3 Fish Oil, plus a good diet and fluid intake, to support your nervous system and neurological functions. As Neuro-Natural includes 5-HTP, is it safe to take with pharmaceutical medications? There is a theoretical possibility of an interaction between 5-HTP and some anti-depressant drugs (SSRIs). There are very few case reports to date of any adverse reactions however. In fact we have found no studies or articles in a well acknowledged database of clinical studies and medical articles. Nevertheless, there is a lot of information available on these alleged interactions, which is why we advise a cautionary note in the event that you are taking related medications. Having said that, we believe the risk is very low with our supplements because of the low dose of 5-HTP that we use. Please check with your doctor prior to taking one of our Neuro-Natural products if you are on a medication of this type. How can I judge the effectiveness of Neuro-Natural General? As Neuro-Natural General is made with many natural ingredients, it is not possible to estimate if and when it is being effective, as everyone is different. However, you can feel confident that the ingredients are 'doing their work' on a cellular level even if you cannot feel an immediate difference. Why should I select Neuro-Natural General over the other three versions? Neuro-Natural General is designed to help provide overall support for your nervous and neurological systems, whereas the other 3 versions use a slightly different mix of ingredients to make them more suited to their specifically stated objectives.